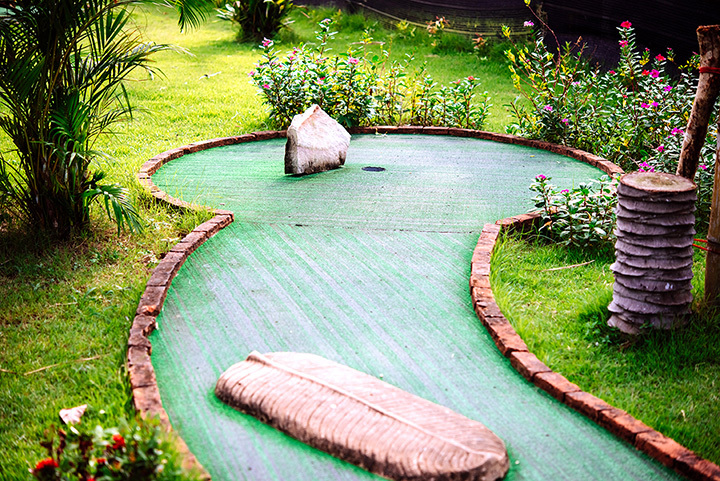 Louisiana is home to several of the best miniature golf courses south of the Mason-Dixon Line. Like the cultural food and sites of Louisiana, these well-maintained links represent some of the best themes around and are sure to bring you and your family a fun day. Here are the nine best! When you’re looking for a great place to take your family, consider City Putt Miniature Golf Course in New Orleans. With creative themes that focus on the city and the state, you’ll have fun and learn a little about the history and demographics of Louisiana. This public 36-hole golfing complex is actually two courses in one and offers refreshing relief on those hot summer days with a specially-designed mist cooling system throughout the course. Parking is free, and there’s a concession stand that sells chips, soda, water, and beer. Open all year round for your putting enjoyment. Lunar Mini Golf in Shreveport, Louisiana, has been open since 2003 with the goal of providing family fun. Featuring an indoor course with black light illumination, there are two other convenient locations in Bossier City and Lafayette, each open every day for your enjoyment. No matter what your age or ability, you don’t have to worry about getting rained out because the fun is all inside! Birthday party packages are available at some locations, and you can get more information by checking the website or calling directly. Noah’s Mini Golf Adventures await you and your family. Located in the heart of Morgan City, this magic wonderland of mini golf is only $3 a person for two hours of putting delight. No matter what your age, you’ll have fun helping Noah and his friends get around the ark, and when you’ve completed your journey, you can cool off at the Spray Park that’s open during the summer. Looking for a great place for a birthday party? Book your next one at Noah’s Mini Golf. Check website for more details. Great fun and great prices are what you’ll find at the Ball Park in Houma, Louisiana. Kids just love coming here to play a round of miniature golf. The only place in town like it for families who love to spend time together, night play is possible by outdoor lighting. The course is challenging without being too much for young players, and birthday parties are a blast here. Batting cages are also available for those who want to improve their batting and pitching. Open every day. Family entertainment gone wild! If you and your family want a fun outing, check out Cajun Fast Track in Breaux Bridge, Louisiana. Go carts, laser tag, an inside arcade, theater, Spin Zone, Tot Spot, and mini golf await you for kids of all ages. Considered one of the best amusement parks in the area and fun for the whole family, Cajun Fast Track has more than 68,000 square feet of fun rain or shine because everything is under roof. Travel along the famous Route 66 on the mini golf course for just $5. Best deal in town! Whether it’s a birthday party, a summer get-together with friends, or fun for the entire family, Kart Ranch is the place to be for a great time. Guests have their choice of go karts, bumper boats, batting cages, arcade games, a rock-climbing wall, kiddie train, and mini golf. You’ll have 18 holes of the best golf adventure around on a course that includes waterfalls and a unique Louisiana-themed environment. Kids under 10 or those with special needs are required to have an adult with them. Group rates are available and there’s a family fun pack that includes pizza and drinks for one low price. Coupons and game cards are also available. Known as a fun place for the community to gather and enjoy time with friends and family, Putt-Putt Golf is Lake Charles’ answer to boredom. If you’re looking for a fun day outside or want to plan an exciting birthday party for your child, look no further than Putt-Putt Golf. You won’t break your budget, and the course, batting cages, and other fun activities are designed with one thing in mind—fun! Open every day, you have options that can save even more money, like the anytime/anyone ticket that allows 10-12 games at one low price. You can also purchase an unlimited golf armband and play all day for just $9 per person. Whatever you chose, be prepared for a fun and laughter-filled experience. Kids and grownups alike love visiting JJ’s Hole an One. Located in Slidell, Louisiana, JJ’s is fun family entertainment that’s convenient and affordable. If you like regular putt-putt golf, you’ll love neon golf! Often overlooked as a form of educational entertainment, miniature golf also teaches concentration, patience, and hand-eye coordination. Open afternoons during the week. Check Facebook page for more details. Kid-centric Party Central in Bossier City is a parent’s delight for safe fun entertainment. Besides having the latest and greatest arcade games, outside bumper boats, batting cages, a bungee trampoline, rock climbing, a 25-foot super slide, go karts, and indoor bumper cars, there’s Bayou Bubba’s miniature golf course with 18 holes of challenging fun for everyone. Perfect for groups and birthday parties, Family Fridays are always special treats and include pizza, drinks, mini golf, tokens, and your choice of the super slide, jungle gym or toddler zone.